This is solar power products at its best. Apple Juicz is designed for the most demanding environments – from Mount Everest to Antarctica to Iraq. Anywhere you need power and don’t have a wall outlet, Apple Juicz delivers. The Apple Juicz is the ideal way to go green. Solar power gives you the freedom to break away from the wall outlet and finally use your MacBookrigid flexible solar chargersoutside – for as long as you like. Not one of those goofy trickle chargers that barely keeps a LED lit, Apple Juicz is available in either 27 Watt or a 55 Watt version. The 27 Watt model recharges your MacBook in from 8 to 12 hours. The 55 Watt model recharges the MacBook Air in as little as 6 hours. For all Apple MacBooks, MacBook Pro and MacBook Air laptops – all including the 13.3, 15 and 17-inch the unibody models and the new white MacBook. The solar cell is both light weight and flexible. No power source is required except for the sun – great for anyone who likes the freedom of working anywhere – outdoors. Whether you’re sprawled out on the foredeck of your sailboat or having a picnic at the park. This solar cell extends your Mac’s battery life. 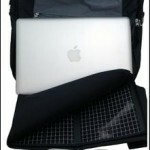 A very cool backpack is included, which stores your MacBook and Solar Cell. This might be the ultimate gift for a college student. Imagine being on the campus lawn using the MacBook without ever running out of battery power.